These tulips are some of the oldest variety I have growing in my garden. They are a true Heirloom Tulip and were first propagated in the year 1595. There are several other color variations on Du Tol tulips and I hope to painting them this spring. 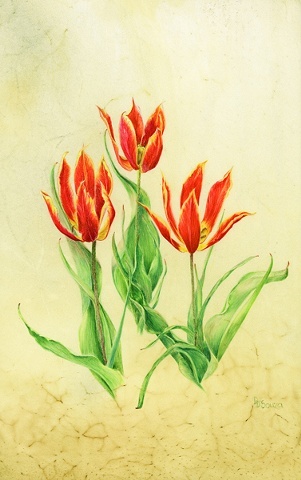 The artwork is painted on calfskin vellum in the traditional botanical practice. The framing is conservation grade with all acid free materials. Frame is light maple.